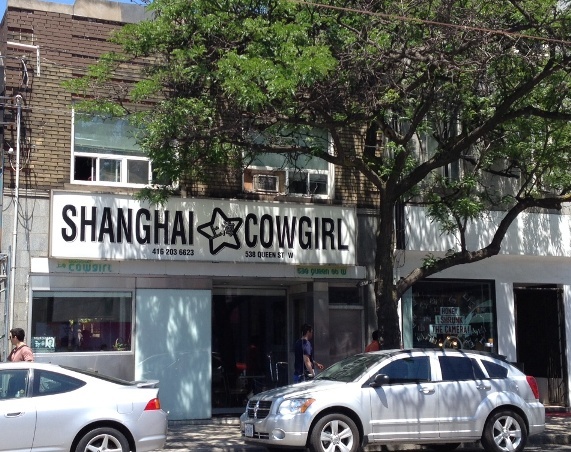 Located on Queen Street, just east of Bathurst, I’m sure we’ve all passed by Shanghai Cowgirl numerous times. 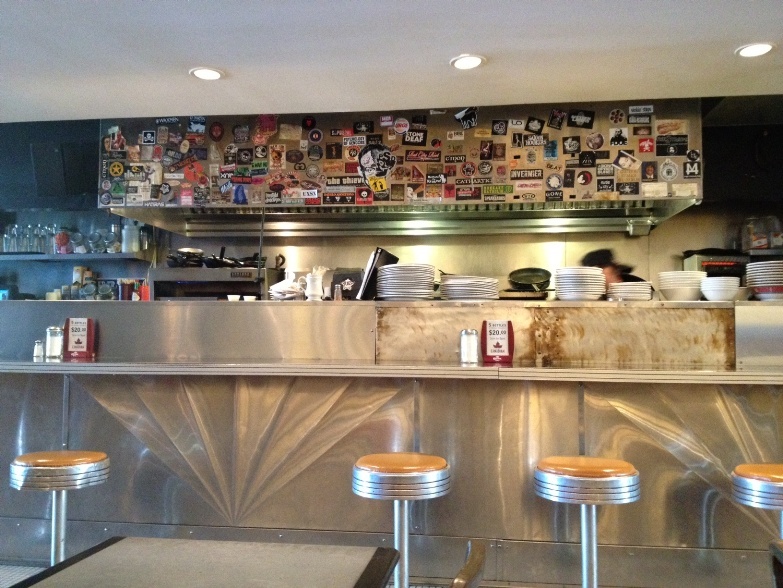 Having been a little curious about this diner, I finally gave in to my curiousity and dropped by one day for lunch. Chris and I found it pretty empty when we arrived around noon. They’re open late into the night so perhaps that’s when they get a little busier. 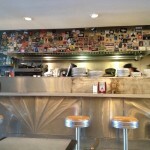 The space has a retro diner feel to it with its open kitchen, stool seating and booths along one side of the restaurant. They also have a patio in the back but since it was 30 degrees outside, we opted to sit inside with the AC. 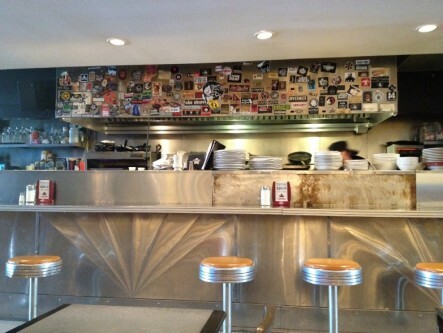 The menu features a selection of sandwiches, burgers, “Almost Healthy” options as well as “Things Mom Used to Make” (chicken fried steak, liver and onions) and all day breakfast items. Since I’ve heard some good things about their grilled cheese sandwiches, Chris and I ordered the Grilled Cheese – with havarti, jalapeno and avocado ($10.75). 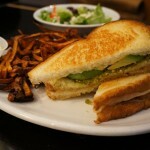 Other grilled cheese options include the cheese, tomato & bacon, blue cheese & peameal and garlic butter & tomato. You also get a choice of white, brown or rye bread. I decided to just stick with the classic – plain white bread. 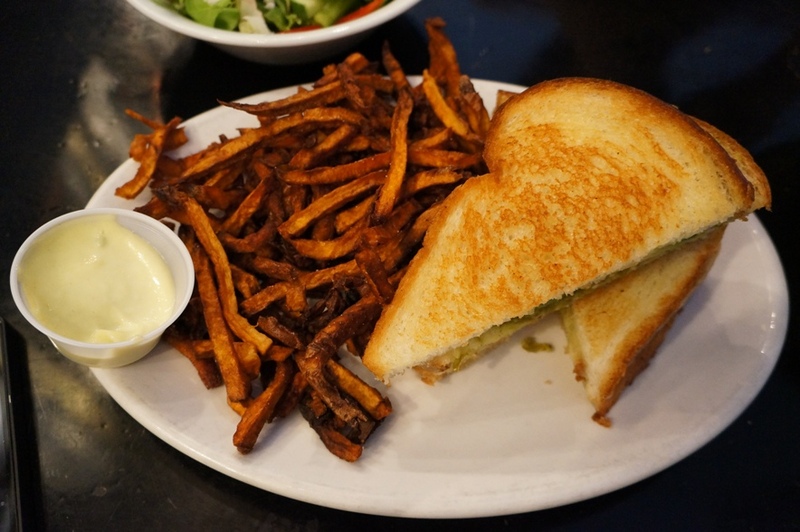 The menu indicated that the grilled cheese was a triple decker so I was expecting a much larger sandwich. 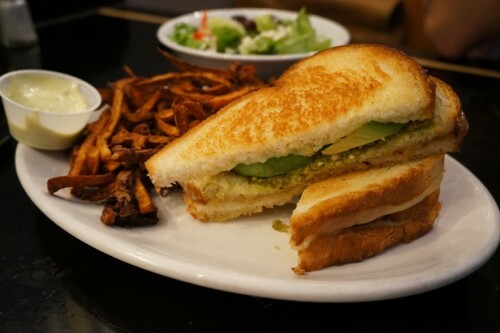 Nevertheless, the sandwich was quite tasty – the buttery bread, the spicy jalapeno spread and the coolness from the avocado was a classic combination. 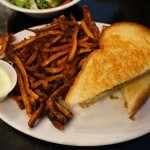 The sandwiches here come with a side of mixed greens or fries. We decided to go with a side of Sweet Potato Fries which came out a little burnt. Although I wasn’t impressed, I have to admit I still ate a fair share of them because they came with a side of delicious wasabi mayo. 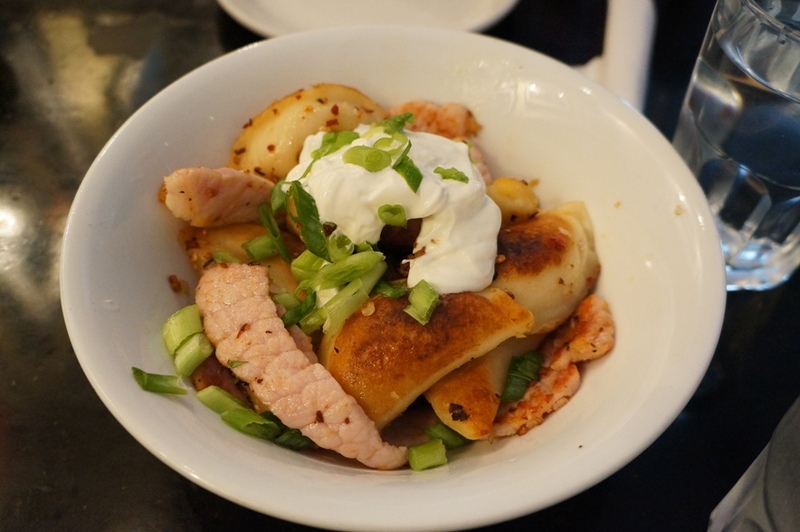 The other entrée we shared was the Perogies – stuffed with cheddar and potato with garlic, chilies, ginger, onions and peameal bacon ($11.95). 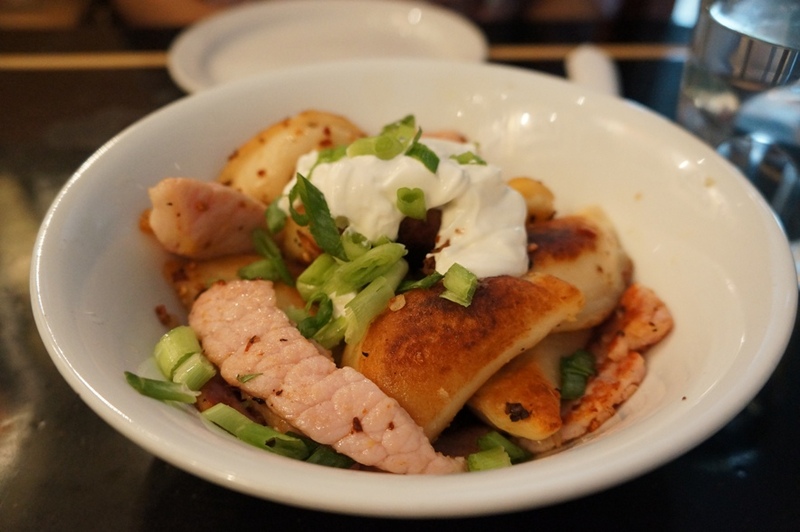 The toppings on the perogies range from the traditional bacon, onions and sour cream to the more Asian-inspired option we went with. It was originally supposed to come with bbq pork but unfortunately they had run out of it and substituted it with peameal bacon instead. 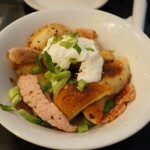 The perogies came topped with an enormous glob of sour cream and large slices of peameal. While the dish satisfied my hungry stomach, I can’t say it was anything special. 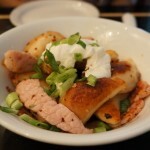 If you’re in the mood for perogies, I recommend checking out Prague Fine Food Emporium. 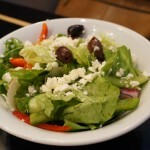 Since Chris was in the mood for some greens to supplement his meal, he added a side Greek Salad ($5). Nothing noteworthy. Overall, Chris and I left satisfied. 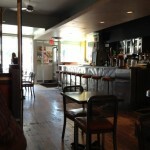 However, while the grilled cheese and perogies were tasty, nothing was particularly memorable. Decent food but I wouldn’t go out of my way for it. Thanks for dropping by, Jason. A new menu, eh? 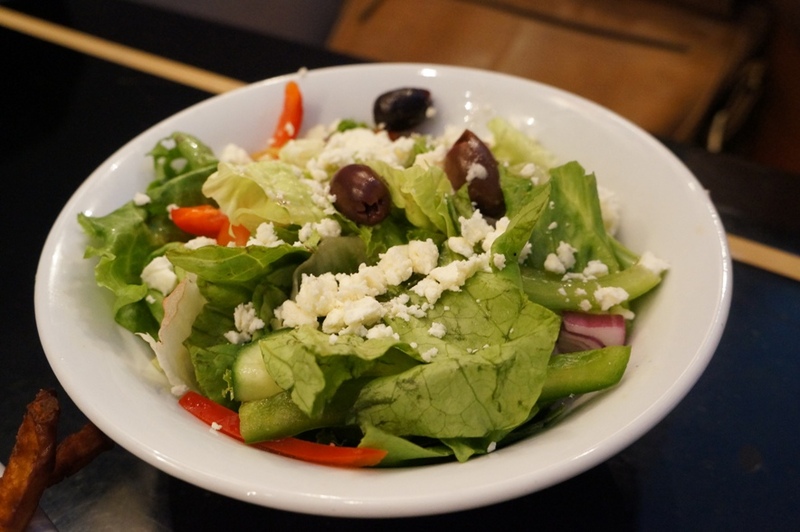 Those items sound tempting – especially the key lime ice cream! 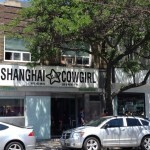 Looks like I’ll have to drop by again… hopefully you’ll have bbq pork in stock next time! 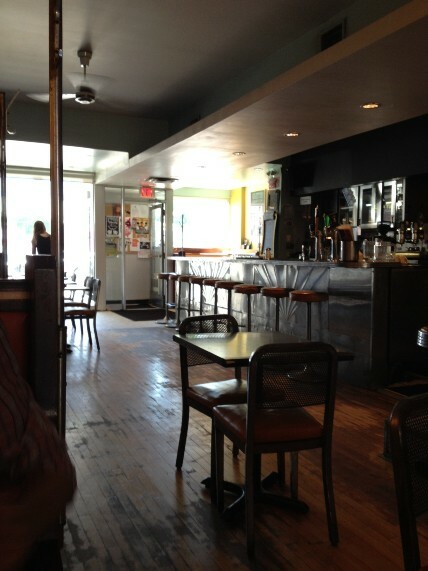 Just had some awesome Spinach and Feta perogies there. The place was good value. I recommend it!